For shallow water running in the most demanding environments, nothing matches the 18 CCT prop tunnel hull. The 18 CCT delivers impressive shallow water dependability, without the learning curve associated with driving a jet powered tunnel hull. G3 is the market leader in tunnel hull designs and delivers the durability and value that have made Gator Tough™ jons famous with sportsmen everywhere. STANDARD PACKAGE Welded .100 gauge hull | Painted high- gloss colors with custom graphics with Tuff Coat™ spray-in liner | Galvanized tubular steel Trail Guard® trailer with locking detachable tongue, space saving and security | 14" radial tires Optional jack plate is available. F50 . F60 . F70 . F75 . 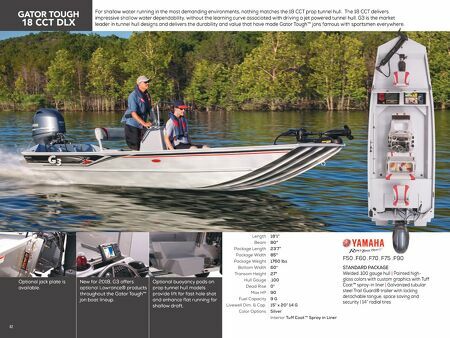 F90 18'1" 80" 23'7" 85" 1760 lbs 60" 27" .100 0° 90 9 G 15" x 20" 14 G Silver Interior Tuff Coat™ Spray in Liner Length Beam Package Length Package Width Package Weight Bottom Width Transom Height Hull Gauge Dead Rise Max HP Fuel Capacity Livewell Dim. & Cap. Color Options 62 Optional buoyancy pods on prop tunnel hull models provide lift for fast hole shot and enhance flat running for shallow draft. 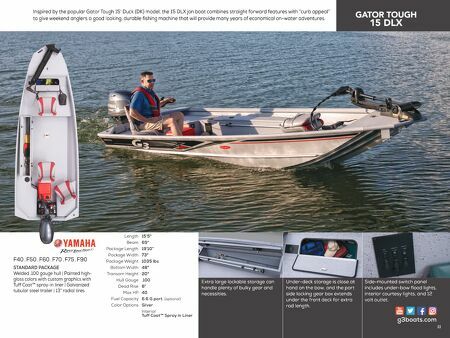 New for 2018, G3 offers optional Lowrance® products throughout the Gator Tough™ jon boat lineup.